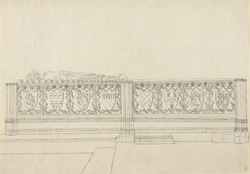 An outline view in ink of the south side of the monuments of Bishop Burgherst (or Burgwash), and Robert, Lord Badlesmere, to the left of the east window in Lincoln Cathedral. The breaks in the base mark the place where the viscera (bowels) of Queen Eleanor of Castile are buried. Eleanor and her husband King Edward I had been present at Lincoln's consecration.